Although primarily known as a conductor, Leonard Slatkin is also an active composer. He studied composition in Los Angeles, at Indiana University, and at the Juilliard School. His first professional works were written for the St. Louis Symphony Orchestra, including The Raven, a piece for narrator and orchestra premiered by Vincent Price in 1971. He also composed a concerto for his mother and brother titled Dialogue for Two Cellos and Orchestra, which was premiered by the St. Louis Symphony Orchestra in 1975 and was subsequently performed by the National Symphony Orchestra with soloists Yo-Yo Ma and Sol Gabetta. In 2004 the National Symphony Orchestra debuted Fin, which Slatkin composed for the NSO’s cycle of fanfares and encores during his tenure as music director in Washington, D.C. In November 2014, the Detroit Symphony Orchestra presented the world premiere of Endgames, a concertino grosso for woodwind ensemble and strings. His latest work, Kinah, an elegy to his late parents, received its world premiere with the DSO in December 2015. In December 2015 the world premiere performance of Slatkin’s Kinah was met with favorable reviews, with critics remarking on its eloquence, poignancy, and evocative use of percussion and strings. 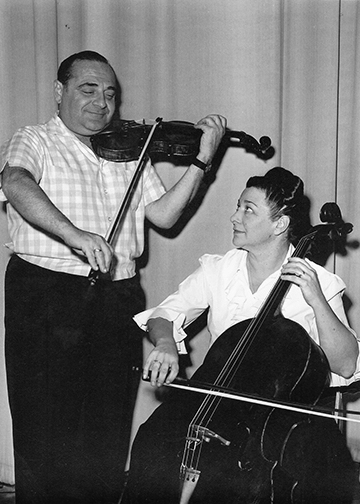 Slatkin wrote the piece as an elegy to his late parents, Felix Slatkin and Eleanor Aller of the Hollywood String Quartet, to mark the 100th anniversary of his father’s birth. For the premiere, Slatkin’s brother, Frederick Zlotkin, played the offstage cello solos on the instrument that once belonged to their mother. The piece incorporates themes from the slow movement of the Brahms Double Concerto, which Slatkin’s parents were scheduled to perform together for the first time when Felix died of a heart attack at the age of 47. The DSO premiered Slatkin’s Endgames, a concertino grosso for woodwind ensemble and strings, in November 2014. Its European premiere with the Orchestre National de Lyon took place in November 2015. Hailed as “delightfully whimsical” and a “feel-good gem” by critic Colin Anderson of ClassicalSource.com, Endgames celebrates the unsung instruments of the orchestra whose players sit at the far ends of the woodwind section: piccolo, alto flute, English horn, E-flat clarinet, bass clarinet, and contrabassoon.